2013 Smart TV -How do I set up Clear Voice? 2. Press and hold the MORE button on the Smart Touch Control. 3. 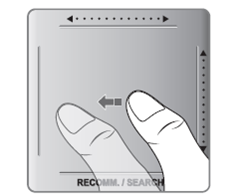 Use the touch pad to navigate on the virtual remote control on the screen and highlight the MENU button icon and then press the centre of the touch pad. 2. Press the Menu button on your remote control. 3. Press the Up or Down navigation buttons to select Sound and then press the ENTER button. 4. Press the Up or Down navigation buttons to select Sound Mode and then press the ENTER button. 5. Press the Up or Down navigation buttons to select Clear Voice and then press the ENTER button. How to use Auto Volume feature in Samsung Smart TV? What is the solution if the sound becomes low while playing 3D video?